Wonderfully versatile, our cold-plates perform all sorts of useful functions. The popular TCP50™ Cold-Plate has a four inch (100mm) square surface and takes less than 10 minutes to reach the freezing point, in a 68 ºF (20 ºC) ambient. Compact, easy to use, reliable and affordable it’s a must for the lab. With no refrigerants or gases, it's also environmentally friendly. 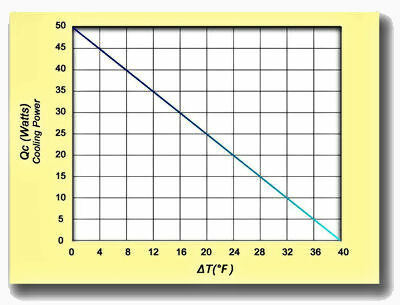 TCP50™ may be used for either cooling or warming. In an ambient temperature of 68 ºF (20 ºC), and with no active load, the surface temperature will drop to about 5 degrees below freezing. Alternatively, the surface can safely be used for warming up to 175 ºF (75 ºC). 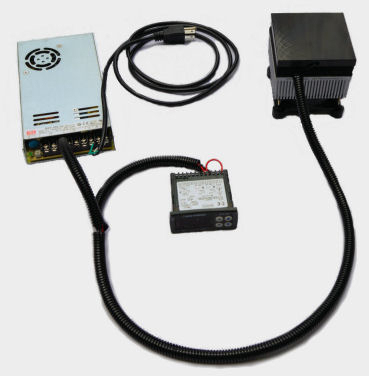 For applications that require temperature control, the TCP50™ can be connected to a temperature controller, like the TLK38-S. With PID control, and an auto-tuning function, this controller can provide a stable temperature that varies by less than 1/3 ºC. TCP50™ is used in a wide variety of laboratory, calibration, test - quality control, electro-optic/laser and research applications. 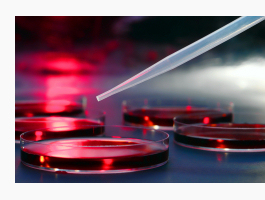 Typical medical/biomedical applications include sample cooling or temperature stabilization, tissue preparation, histology, cold & hot dry wells, pain/nerve research and work with cultures. With a 100mm square surface, the TCP 50 will accommodate Petri dishes up to 100mm but 80mm seems ideal for temperature uniformity. While typically used on a laboratory or work table the TCP50™ may be mounted in any orientation. Many customers have used multiple units to "sandwich" (or surround) an item requiring cooling from two or more sides. The cold-plate can be customized or fabricated for customer specific applications such as mounting sensors or optics packages. The plate is 6063 aluminum with a black anodized finish. Contact us for a machining quotation if you need ten or more TCP50s. If you need a larger surface area see our 4 x 8" TCP100. 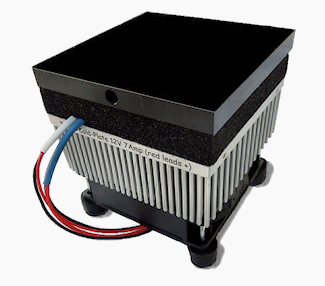 Voltage Nominal = 12V D.C.
Voltage Max = 15V D.C.
Exports are generally shipped FedEx collect. USPS International Express and Priority Mail available Pre-Paid. 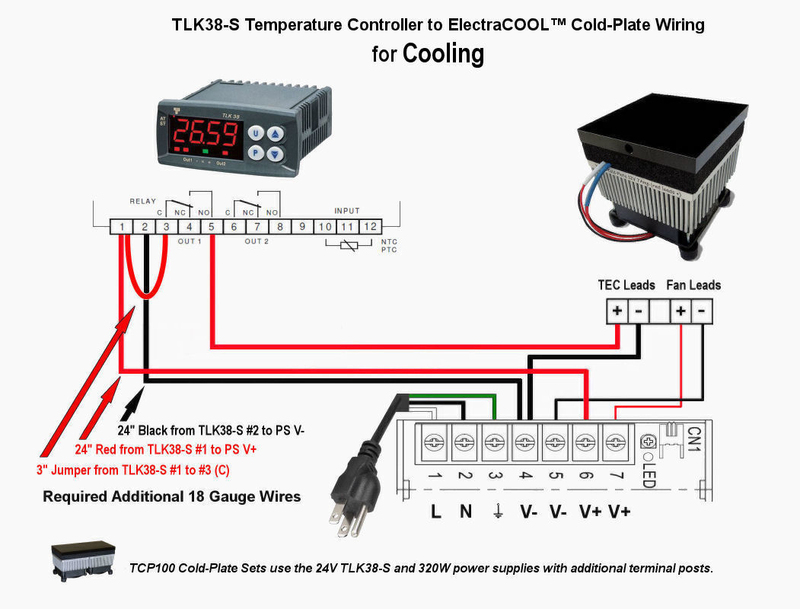 Each TCP50™ Set includes a TCP-50 cold-plate, a TLK38-S temperature controller and RSP150 Watt (.pdf) universal power supply for use worldwide. When you purchase an ElectraCOOL™ Cold-Plate Set, we've taken care of setting things up. Simply plug-in and your cold-plate is ready work. The default surface temperature is 4 °C (39 °F) however, we are happy to program and calibrate to a different set-point. Please advise and allow 2 days for modifications and test. After set-up is complete most customers place the power supply and controller off the bench. The length of the wiring is 36” (90 cm) from the cold-plate to the supply. Quantity and international buyers please contact us for a quotation, or to place your order: sales@electracool.com or (603) 888-2467. Tested and calibrated to your set-point (other than +4 °C). This service is free - please allow 2 business days.